Well, it’s ‘tomorrow’ and the pre-order is under way. Our savvy web surfer submitted the pre-order form yesterday and the archivist on ‘pre-order duty’ has received my details. 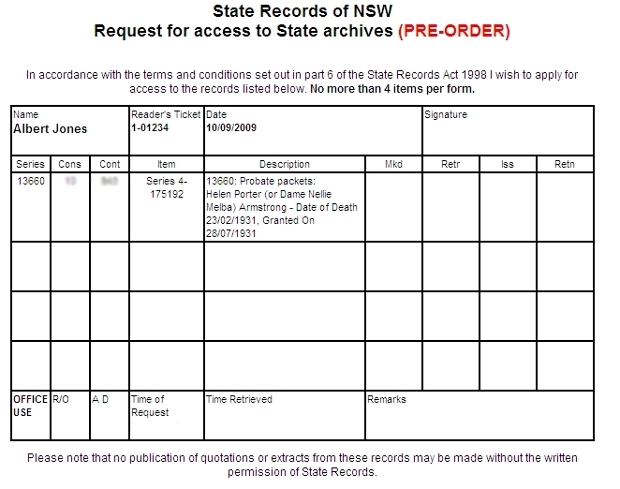 If you are just tuning in to the “Day in the Life of a State Archive” series then here is a brief run-down: I’m a Probate Packet living at State Records NSW. Someone found me on the Internet and has requested to see me in a few days time. 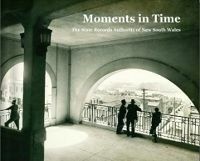 As mentioned yesterday, there are several ways you can ‘book in’ to view records at State Records NSW. The new option in Archives Investigator is straightforward and streamlined. Staff were fortunate enough to work with the programmer during the development phase and explain the process – from request to delivery. Unfortunately, not all items are listed in Archives Investigator [yet] and so the other methods will remain for some time to come. This (image above) is the information the archivist has received. There is the reader’s name; reader’s ticket number and date of impending visit. The metadata includes the series to which I, the item, belong, the item number and a brief description (this helps to quickly verify the information is accurate and to alert staff to the type of record being requested). The benefit of the new system is that the information is received in the form of a request slip, similar to those used in the reading rooms. The online request slip is simply printed out, the information verified and placed into the pre-order retrieval box. The older methods are more clunky and require the archivist to (in addition) check the “open to public access” status in the Register of Access Directions and transfer the request details by hand onto a retrieval slip. The archivist also confirms the order with the client whereas in the new system a confirmation email is automatically generated. I’ve received the green light and have been placed in the pre-order queue. Hoorah! Oh the anticipation…will I be presentable enough to make the cut? How do you manage your ‘pre-order’ requests? How much information does the reader have to supply?